A native of Oakland, California, Ian Jones fell in love with the cello and chamber music while attending The Crowden School, a Berkeley middle school which incorporates music into the everyday curriculum. His studies took him to UCLA and Indiana University, and he continued at IU for graduate studies with Eric Kim and Janos Starker. A committed chamber musician, in 2008 his string quartet was awarded the school-funded Kuttner Quartet fellowship at IU. He has benefited from close collaboration and coaching with Indiana faculty members including Atar Arad, Alexander Kerr, Paul Biss and Yael Weiss, and has appeared performing chamber music with Joshua Bell and members of the Orion Quartet among others. He earned his master’s degree in performance in 2013 studying with Mark Votapek. Ian began his orchestral career in 2006 playing in the cello section of the Honolulu Symphony, and has since performed with ensembles around the Midwest and Southwest. 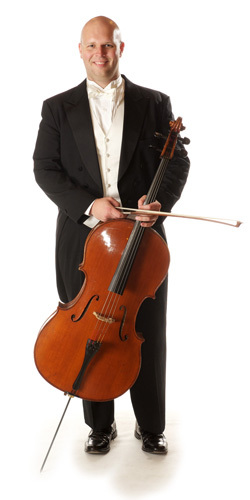 He joined the Tucson Symphony Orchestra in 2011, and has since been appointed assistant principal cello. Apart from the Symphony, he has performed with other arts organizations around the Southwest, including Tucson’s St. Andrews Bach Society, Phoenix’s Downtown Chamber Series, and Albuquerque’s Chatter ABQ. In 2016 he was invited to fill in as cellist of the Baumer String Quartet, performing and teaching at the Summer String Institute at the University of North Texas. Beginning in 2012 he has appeared in Colorado on the Breckenridge Music Festival’s Winter Concert Series, and since 2014 spends his summers with the BMF for their regular concert season. An avid tennis player, Ian competes in USTA leagues in Tucson and the San Francisco Bay Area.